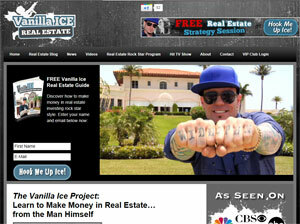 Seeking to become the next Tom Vu or Dave Del Dotto is rapper Vanilla Ice (né Robert Van Winkle), best known for his early Nineties mega-hit “Ice Ice Baby.” He has launched a website called Vanilla Ice Real Estate, which is apparently an outgrowth of some reality TV show he did called The Vanilla Ice Project. The “pros” of enlisting a property management firm is that they usually have a solid leasing system already in place on how to manage properties, they have relationships with vendors like eviction attorneys and maintenance men who are needed to run a great management system and they can handle all the issues and calls with tenants. The “cons” are that they charge 10% of the gross rental income, which can account for a large percentage of your positive cash flow. Nonetheless, I fervently hope that Vanilla Ice goes ahead and starts broadcasting a TV infomercial for his real estate investment system. If so, he would be the fourth member of the Surreal Life season two cast to have appeared on a TV infomercial (the others being Ron Jeremy, Erik Estrada, and Tammy Faye Bakker). Certainly it would be more entertaining that the latest Armando Montelongo snoozefest. I hope he doesn’t eventually trash the houses like he did the MTV set during the 25 Lame show in 1999 (type in “25 lame vanilla ice” on YouTube and you’ll see what I mean). 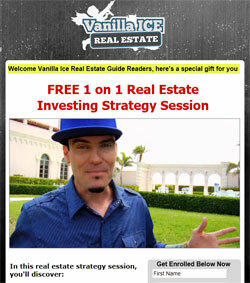 Would LiKe INFORMATION on VANILLA ICE REAL ESTATE PROGRAM .. THANK YOU !